Church folk often take ourselves too seriously. Jim’s warm-hearted, but edgy, cartoons help us to see the funny side of church life. No one is spared – clergy, organists, parishioners – all get a gentle prod. Good, thought-filled fun, well balanced between the trite and the bite of cartooning humour. Crazy Christians – fuming fundamentalists – loopy liberals – batty believers – oddball organists – vivacious vicars – peckish preachers – antsy angels – Elvis, Jesus and the occasional sheep. This book proves why religion and cartoons are a dangerous mix. You might just die laughing. 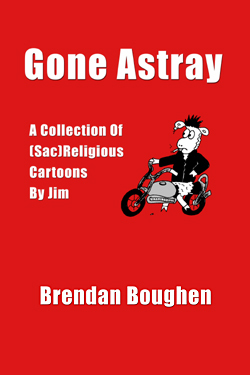 Jim has been drawing (sac)religious cartoons for more than 10 years. This is his first collection. “If you’ve ever been a member of, or simply attended a church for any length of time, you might find some characters to be quite familiar. You’ll meet conservatives, liberals, fundamentalists, progressives, grumpy Lutherans, crazy Anglicans, Buddhists, rebels, organists, terrorists, organists who are terrorists, angels who are pigs, agnostics, antagonists, atheists, and Jesus himself … who I don’t think minds being drawn. First up though, you’ll meet a guy called Jeff. If you can follow the thread of his spiritual journey over this decade of cartoons, you’ll have some small sense of my own path during that time. By the end, I hope you’ll feel that maybe cartoons and religion aren’t such a bad mix. After all, they do have a lot in common. Both are paths to uncovering truth and revealing the meaning of life. But while religion is about finding order and solace in the face of the apparent random swirling chaos of the universe, cartoons are about laughing in the face of that terrifying reality. “William Fry said, ‘a belly laugh is internal jogging.’ The health benefits are enormous. Laughter lowers blood pressure, increases circulation and improves heart health. Laughter is even used in some psychotherapy. Laughter is also great spiritual practice. It stops us from taking ourselves too seriously. It’s a lesson in humility, and not taking life so personally. That’s why I’m so excited that my friend Jim has published a collection of his funniest cartoons in a collection called Gone Astray. Jim, aka Brendan Boughen, and I were partners in ecclesiastical crime in Auckland, New Zealand. Jim pokes fun at the church, church leaders, fundamentalism and literalism. No one is spared in this riotous collection. 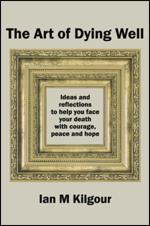 You will laugh, you will wince and ultimately you will find your life and health enhanced by reading Gone Astray”. Brendan Boughen’s (Jim’s) cartoons have featured in magazines and websites in Australia, New Zealand, the UK and the USA. He has drawn cartoons for businesses, hospitals, community organisations and churches, and is an associate member of the Australian Cartoonist’s Association. 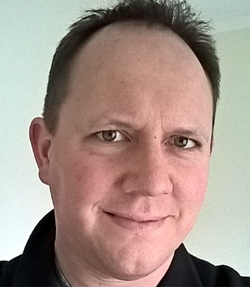 Jim draws black and white gags, full-colour cartoons, single panel or comic strips that aim to go a little deeper than most and work on multiple levels. His 2016 book Sounds Like a Game Changer (Nnw available as an eBook in ePub. 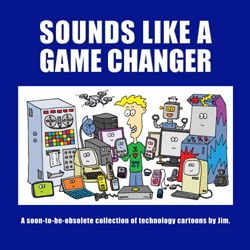 Kindle and PDF formats and as a print-on-demand book) gathers more than 100 of Jim’s best tech cartoons alongside his written thoughts on his experiences communicating about technology as it’s evolved over the last crazy, game-changing decade. 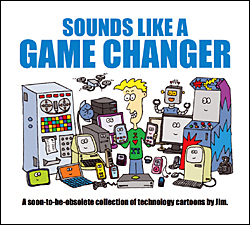 These days, Jim’s cartoons can be seen monthly in the editorial pages of the New Zealand Methodist Church’s Touchstone magazine and randomly in a variety of publications around the world.